The Local History Club ended its activities this year with its annual trip. First we went to Carmarthen to see the memorial to Thomas Picton and hear about his eventful life. We then visited a Norman motte and bailey castle at Rhyd-y-gors before going on to learn about the history of Ferryside. Next we went to St Ishmael’s Church and saw the remains of Hawton village which was destroyed by the sea in 1606. After viewing the Kidwelly Industrial Museum which displays the history of tinplating in the area, we learnt about Kidwelly Castle before our evening meal together. The picture shows club members in front of the castle. 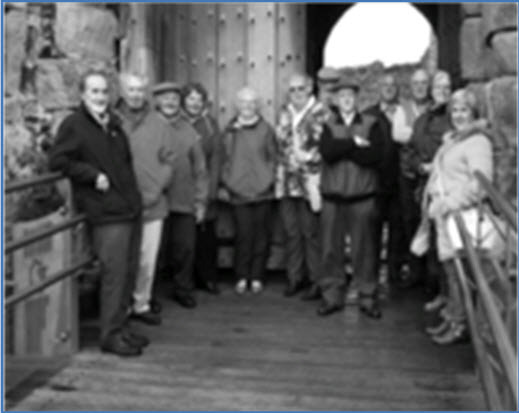 The Llanfihangel-ar-arth Local History Club meets every fortnight on Thursday evenings in the Neuadd yr Ysgol, Llanfihangel, to discuss local history particularly in the parish. Ordinary meetings are held in Welsh but learners are welcome. Members pay £1 a session towards the cost of hiring the Hall. Every other meeting is open to the public when there is an invited speaker, a film or audio presentation on some aspect of local or Welsh history. The open meetings may be in Welsh, English or bilingual. There is usually a small charge to help pay the speaker’s costs and hiring the Hall. Since its formation the Club has produced a Historical Map of the Parish – cost £3 (in Welsh but English text available for 50p), installed an interpretation panel in Llanfihangel, produced a bilingual book of old photos – History of the Parish in Pictures – cost £8, and a DVD in Welsh, Straeon a Strabs, which includes stories about Llanfihangel – cost £8. Copies of the above are available through Club Members.